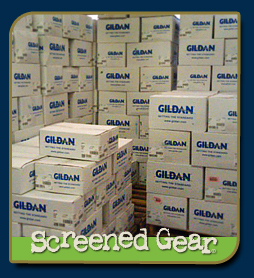 What is your turnaround time for Screen Printed Shirts? Screen printing jobs are done in 7 to 10 business days from the time we have the final design approved and the 50% deposit. How many colors can you print on a shirt? We can print up to 6 colors per location. 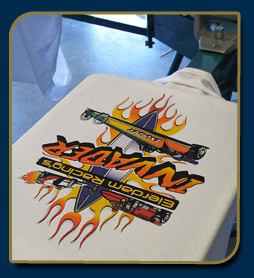 On larger orders or with screen fees we can print up to 9 colors on colored shirts and 10 colors on white shirts. What is the largest print you can do? Our largest print size is 15 inches wide by 17 inches tall. 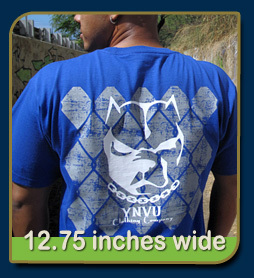 Most prints are less than 12.75 x 15 tall, this is big enough to cover most of the front of a shirt. Can you print over seams and collars? We can. It takes a little more time but we are willing to do this type of job. Call us to talk about it. What's the largest order you can do? Can I do more than one type of shirt or color with the same design? Yes. You can as long as the location stays the same and the design stays the same size. You can do tanks, girls shirts and guys shirts all in the same print run. If we have to change a color of ink there is a $15 fee per color per location. What if my shirts come out looking really bad? We guarantee all of our work. We work hard to make sure every job we do is the best it can be. We take every precaution to make sure your job comes out right. If we make a mistake, we always reprint or fix the mistake. Can I watch my t-shirts being printed? No. Our company policy does not allow for clients to be in the shop while we are printing. Can I get a discount on my order? I will be ordering alot of shirts from you. No. Well maybe, we build strong working relationships with all of our clients. Many of them order hundreds of shirts a month. When you start ordering large orders on a regular basis we will work out some price breaks for you. If you want a quote then use our order form its fast and easy. (get a quote) We will get back to you within a few hours. If you want it faster give use a call at 602.206.1291. If you have questions call us at 602.206.1291.